The Catholic pontiff does more than just spread the Vatican’s word across the world, as he also spreads the ‘gospel’ of Ukrainian nationalism and victimhood, too. 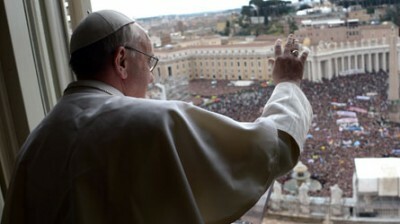 Francis made headlines when he said the mass killing of ethnic Armenians in the last days of the Ottoman Empire was “the first genocide of the 20thcentury”. Largely lost amidst the ruckus is his previous statement that “the remaining two (genocides) were perpetrated by Nazism and Stalinism”, which was a strong allusion to Ukrainian nationalists’ decades-long campaign to have the Golodomor recognized as genocide, to which the Vatican, and especially Francis himself, are ardent proponents. President Putin remarked in his annual Q&A session that “Attempts to put [Nazism and Stalinism] in the same basket are absolutely baseless… As ugly as the Stalin regime was, with all its repressions and ethnic deportations, it never attempted to eradicate [an ethnic group] completely”, and although his words were likely in response to recent Ukrainian legislation that ludicrously equates the two, his comments are just as relevant to the Pope as they are to Poroshenko. Part I of the article begins with an overview of the Vatican’s historic geopolitical antagonisms against Orthodox Russia, including the role that Catholicism and its Polish-Lithuanian Commonwealth proxy played in the external construction of the Ukrainian state. It then explores how and why Ukraine is still a battlefield in this epic saga, as well as detailing the US’ geopolitical designs for the country in its quest to transform it into a forward-operating base against Russia. Part II dispels the “genocide” myth surrounding the Golodomor and shows how a handful of radical states have seized control of the conversation to further their Russophobic aims. The series then climaxes with an in-depth examination into Pope Francis’ claim that the Golodomor is “genocide” and his statements of inferred support for the Organization of Ukrainian Nationalists, both of which serve historically revisionist anti-Russian ends and make Pope Francis poised to become one of the New Cold War’s most notorious actors. Throughout the ages, the center of Christianity has shifted from West to East as result of certain geopolitical tectonic movements. Beginning with thefall of the Roman Empire in 476, the Byzantine Empire (or Eastern Roman Empire) centered on Constantinople took up the torch of worldwide Christian leadership, hence its designation as the “Second Rome”. 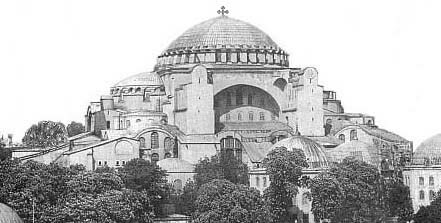 Throughout the subsequent centuries, the differencesbetween Western (Roman) and Eastern (Byzantine) Christianity widened to the point of a spiritual chasm, and when Rome unsuccessfully tried enforcing its views on Constantinople, the Schism of 1054 occurred. Since then, the Vatican has been consistently antagonist against the Orthodox Church, and it’s highly recommended that the reader reference Fort Russ’ epic examination on the topic, “The West against Russia: The Vatican against the Orthodox Church”, to gain a deeper understanding of the events that henceforth transpired. To sum up events over next millennium (as difficult as it is to do so in brief), after Constantinople fellto the Turks in 1453, the center of Christianity once more shifted, albeit this time to Muscovy. Ever since the Baptism of Vladimir the Great in Crimea and the Christianization of Kievan Rus in 988, this civilizational sphere had vehemently ascribed to Orthodox Christianity, owing to its cultural and political affiliations with the Byzantine Empire. Following the fall of Constantinople, Moscow carried on the Christian torch and became the “Third Rome”, which created a major inferiority and sectarian complex back in the Catholic “First Rome”. From thenceforth, the Vatican redirected its aggressive geopolitical calculus from the Sea of Marmara to the State of Muscovy, even going as far as supporting its Catholic client state, the Polish-Lithuanian Commonwealth, in its militant proselytization eastward. Other than having previously occupied and forcibly converted the historically Orthodox territory of the former Kievan Rus, Warsaw took its campaign all the way to Moscow during the Time of Troubles, even briefly occupying the Russian capital from 1610-1612 and imprisoning the Orthodox Patriarch, who they would later starve to death as a martyr. It wasn’t long after the Polish occupation began that the Russian people banded together (as they so often have during their most troubling historic periods) and began the campaign to purge the Poles from their land, in a moment of glory that is nowadays commemorated as National Unity Day every 4 November. The liberation of Muscovy from the Poles began the nearly two-centuries-long struggle that would see the Russians pushing the invading menace all the way back to its home territory (an historical prelude to what would later happen to Napoleon and Hitler, although in much shorter timeframes), all the while working to restore the civilizational heritage of Kievan Rus that the Polish occupiers had spent centuries trying to dismantle. Part of the Polish plan had been to spiritually partition the western reaches of this land from its central core, which led to the imposition of Catholicism over the Orthodox people that had originally inhabited modern-day Belarus and especially Ukraine. One of the most novel forms that this took was the creation and promotion of the Uniate Church (also known as “Greek Catholicism”), an artificial religious construct created by Rome which fused many Orthodox practices with loyalty to the Catholic Pope. The effect of this religious manipulation served to de-facto spread Catholicism amongst the remaining Orthodox ‘holdouts’ in the region, thus fostering the myth of “identity separateness” among the population which could be strategically activated to increase resistance to Russia and aid in slowing down Moscow’s prolonged counter-offensive in liberating Kievan Rus from the Poles. In the coming centuries, the spiritual separateness of parts of modern-day Ukraine would be used as the foundation for the external construction of the “Ukrainian nation” by the German General Staff in 1918. Lenin’s recognition of a so-called Ukrainian Soviet Socialist Republic in 1922 provided ex post facto legitimacy to this Vatican-Polish-German creation. The greatest legacy of Lenin’s mistake was that he grouped together the Catholic-adhering /pro-Polish/”Ukrainian”-identifying western areas with the reawakened Russian- and Orthodox-affiliated east, which consequently created an unstable entity whose externally influenced western reaches could be used to destabilize the entire thing. Had he kept both parts separate and perhaps designated only the western portion of modern-day Ukraine as “Ukraine” owing to its foreign peculiarities, then the situation could have been dramatically different. 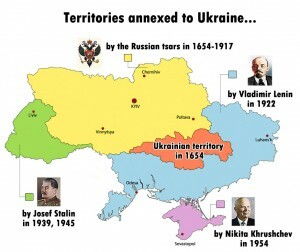 Nonetheless, ever since the geopolitical designation of Ukraine (roughly translated as “borderland”) was unilaterally birthed by Lenin’s decree (only to grow under Stalin and Khrushchev), the entire territory has become a focal point of Western aggression waged by its associated political and spiritual powers. A perfect example of political weaponization over the territory of Ukraine was the Polish-Soviet War, whereby Moscow attempted to finally liberate the last vestiges of Kievan Rus from foreign occupation (having switched from Polish to Austrian then back to Polish control). Warsaw refused to peacefully withdraw from the territory due to its understanding that centuries of Polonization and Catholic proselytization (political and spiritual factors) intrinsically made it a separate entity than it historically used to be, and the Poles were able to successfully extend their control over the region until 1939. Prior to that, Polish leader Josef Pilsudski preached the policy of Promtheism, whereby the Polish state encouraged ethnic minorities in the Soviet Union (especially Ukraine) to rise up against the central authority as a ‘celebration of their separateness’ and secede into a constellation of what would then become pro-Polish satellite states. It ultimately failed to achieve its ambitious goals, but the legacy of separating Ukraine from Russia continues into the present day via Zbigniew “without Ukraine, Russia ceases to be an ‘empire’” Bzezinski and his Grand Chessboard strategies. Enter the Vatican, which has made a concerted effort to pluck converts out of the confused Ukrainian territory since the end of the Soviet era and extend its reach ever eastward into originally Orthodox lands. Ukrainian Prime Minister Yatsenyuk visited the Vatican last year with a scheme for souls that amounted to an alliance proposal, but due to the fragility of the Kievan regime and the associated dim prospects for the partnership’s success, Francis turned it down. It’s not to say that he wouldn’t have accepted it had it been proposed on more solid political grounds, since the Vatican’s goal has always been to proselytize Catholicism eastward at the expense of the Orthodox Church. Not only that, but the Vatican has been opposed to Moscow in geopolitical manifestations as well, as can be seen by Pope John Paul II’s Cold War “Holy Alliance” (in the words of Time Magazine) with Ronald Reagan against the USSR. There is thus clearly an established precedent set in modern times for using the spiritual authority of the Catholic Church as a front to advance geopolitical objectives, meaning that, as it will later be argued, it’s not unreasonable to link Pope Francis’ support for the Holy Grail of Ukrainian nationalists, the Golodomor as “genocide”, to larger geopolitical plans directed from Washington. Shifting of the Russian strategic defense line for the last 25 years. The first step is to prevent the reintegration of Ukraine into the Russian fold, be it economically through the Eurasian Union (as then-Secretary of State Hillary threatened one year before EuroMaidan) or militarily through the CSTO, by highlighting artificially imposed Ukrainian ‘separateness’ (Polish-enforced Catholicism and Vatican-constructed “Uniates”) and selectively emphasized victimhood (Golodomor as “genocide”). The Western idea is that if Ukraine, a fraternal and religiously related entity, can be made to hate Russia and turn against it, then so too can less intimately affiliated ones like Kyrgyzstan, or, as Brzezinski’s Eurasian Balkans asymmetrical attack plan suggests, even Tatarstan and Chechnya one day (again). The second stage expands upon the ‘success’ of the first one in turning large segments of the population against Russia, but this time it includes a tangible military dimension. The concept here is to make Ukraine either a de-jure or de-facto (shadow) member of NATO, which in effect would eliminate the valuable strategic depth that Russia has through the country’s neutrality. It needs to be mentioned at this point that the Color Revolutionary authorities in Kiev already revised the country’s constitution in order to eliminate its previous references to neutrality, thus meaning that NATO membership (be it de-jure or de-facto) can continue moving forward at full speed. The more strategic depth that NATO is able to successfully chip away from Russia, the more likely it is to tip the military balance away from parity and towards a first strike scenario, which would then place Russia in a position of nuclear blackmail. The final phase of the US’ weaponization of the Ukrainian state is to have Kiev stage provocative actions that would elicit a Russian military response, preferably rash, hurried, and not thought out to the end. The Reverse Brzezinski, as the author calls it, sees the Polish-American strategist reverting back to his Afghan War roots in goading Moscow into a quagmire, but thankfully, President Putin appears to have caught on to the ruse and reaffirmed during his Q&A session that he war between the two states is “impossible”. No matter the President’s intention, however, the US will certainly continue trying to create the tempting pretext for a Russian military intervention, hoping perhaps that yet another slaughter of Russian-affiliated Eastern Ukrainians might be the tripwire for tricking Moscow into conventionally responding one of these days.